John Rivera, Dade County PBA president, (center) spearheaded a lawsuit against the mayor and won big—again! They say battling it out in court should be the last resort: it’s expensive, takes resources away from other important tasks, and you never know what the outcome will be. But there are times it’s the only option, and when the Miami-Dade Mayor decided to veto an impasse hearing, the police union had no choice but to go to court with every gun blazing. 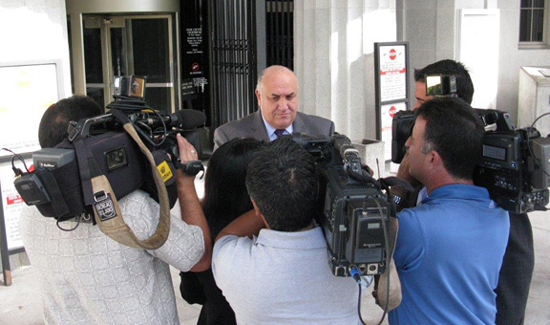 The court’s decision in favor of the Dade County PBA should not have been a surprise to Miami-Dade Mayor Carlos Gimenez, who has lost just about every battle he’s had going up against the PBA’s attorneys, who are known for being well prepared and more than competent in the courtroom. Following intense arguments from both sides, the appellate court ruled that Mayor Gimenez does not have the authority to veto an impasse hearing. Enraging Dade County officers was the mayor’s imposition of an additional five percent deduction to taken out of their paychecks—ostensibly for healthcare. The PBA demanded an impasse hearing before the Commission regarding the so-called “health care contribution.” The PBA requested that zero percent be imposed. In other words, the union was demanding that that no further money be taken from their members’ paychecks. The Commission initially agreed with the PBA and imposed zero percent. The mayor then vetoed their decision and once again threatened layoffs. Following the mayor’s veto of the commission’s decision, the commission did an about-face and imposed a four percent deduction. That prompted the PBA to file an unfair labor practice charge with the Public Employees Relations Commission (PERC). PBA lawyers argued the case in front of the District Court of Appeals. It was shouts of happiness and high-fives all around when the PBA learned the court ruled in their favor. But all celebrations were short-lived, as the PBA prepares to fight an appeal that the mayor will no doubt pursue. The Dade County PPBA is a founding member of our sister site, PubSecAlliance.